Hello everyone! I’m Max from China, and glad to meet you! I hope my poor English would not bother you. Though I am in my twenties, I am still into The Lion King. (Yes, watching the death of Mufasa still makes me want to cry). I cannot overstate the influence of the Lion King on my life. If it weren’t for the Lion King, I wouldn’t be a cinephile. If it weren’t for the Lion King, I wouldn’t be interested in soundtracks and classic music later on. Sadly, I don’t pursue a film career for many reasons. But I still enjoy watching films. I watched The Lion King for the first time at my 12, I suppose. And I was shocked by the vibrant animation, epic atmosphere, amazing music and moving plot. And I was not fond of, if not hate, traditional hand-drawn animation film and musical then. But I immediately became a fan of traditional hand-drawn animation film and musical after. And I was into all kinds of films later on. I wish Disney could continue to produce traditional musical animation film just like what they did in the 90s. I have been here for a while, and I finally make up my mind to register and post now. Because I did not feel any urge to post here before and I do not have much spare time to check up this forum on a regular basis. 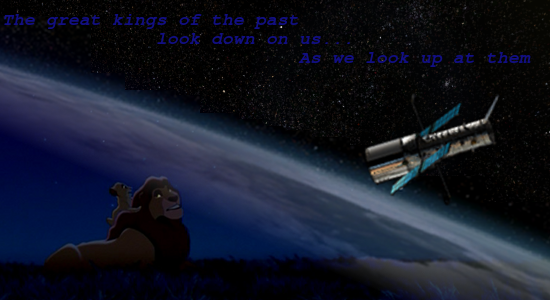 But I concern myself with the CG remake of The Lion King lately, I want to keep up with the latest news about it. And another motivation is that I would like to share with you an essay I wrote recently at https://timelimitexceededblog.blogspot. ... ff-of.html. I wonder whether it would be appropriate to bring up this so-called Kimba controversy issue but my essay mainly cover it from a rather objective POV, refuting two very misleading and biased YouTube videos in detail. It was translated in a hurry so the translation might be not so good. I hope you would find it informative. And feel free to offer suggestions to me. And I hope I can also get a lot of information about the forthcoming The Lion King CG remake film here. I just can’t wait to watch it! I might not be able to post frequently here but I am more than willing to participate in any activity if I am needed. (Sadly, I have no talent for drawing or writing stories. I guess writing film criticism is not quite in need here, lol) Feel free to ask me questions or PM me, I will reply as soon as possible. Nice to meet you here! By the way, the Chinese New Year is coming. Happy Chinese New Year! Last edited by TimeLimitExceeded on April 10th, 2019, 1:17 pm, edited 4 times in total. i’m in my 30’s and i’m still into tlk. I think that essay should be ok to post as long as it doesn’t have anything obscene in it. i’ll read it when i have the free time. but most importantly, welcome to the pride! Welcome to MLK, TimeLimitExceeded! I have your essay opened in a new tab and will read it sometime this week - I'll let you know what I think of it. You can just call me Max. Thanks for your warm welcome. It gives me great pleasure to make your acquaintance! Hello rachel and Max, glad to have you in our Pride. Hey everyone, I'm Heleigh. I was supposed to make a profile ages ago, but better late than never! I'm a big TLK fan, especially loving the relationship between Mufasa and Simba! I have always admired their father-son bond, I hate when Muffy dies But at least he is always alive in my universe! Nice meeting all of you again, after lord knows how long. Hi. I'm new here too. I like the lionking and like scar the best. I have a few drawings, but I don't draw very well. Hello to Heleigh, and R+A511. It's great to have all of you in The Pride.